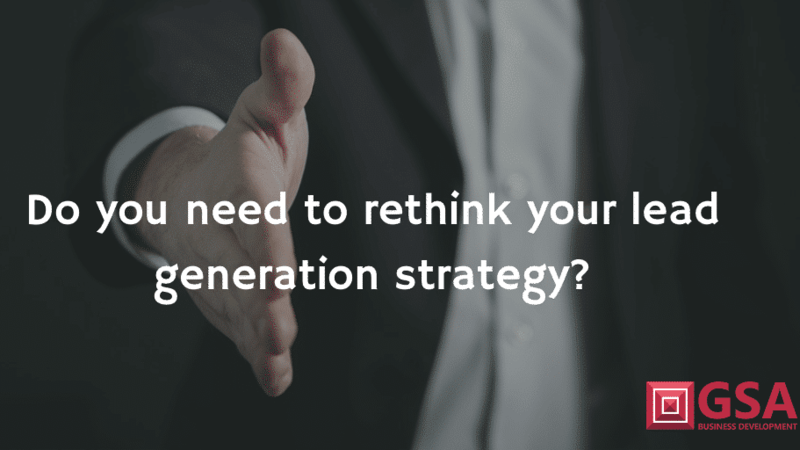 Do you need to rethink your lead generation strategy? Whilst the perfect world would be to have a significant bank of profitable customers that never leave your side and a crowd of prospects beating a path to your door, that isn’t the reality for most businesses. Even the biggest and the best have fierce competition and suffer attrition. Therefore, lead generation and retention are ongoing challenges. Most businesses need to generate new business and to stimulate further sales from existing customers in order to survive, develop and grow. In the old days, it was perhaps more straightforward. Visit a trade show. Go to a networking event. Place some advertising. Push out some press releases. Knock on some doors even. But, nowadays we have a snowstorm of opportunities, channels, communication, messages and methods of sales lead generation that make things complicated and that stretch budgets and resources. Alongside the relatively new entrants to the party, some traditional methods have become more sophisticated. And some, such as direct mail and come back into favour. Whether it’s retargeting, content syndication, native advertising, the use of artificial intelligence, big data or marketing automation, it’s hard for businesses to keep up to date. If you operate within a large business with functional heads, you may be able to allocate resource to look at the various methods. In small to medium sized businesses, it’s tough to keep pace with change. But, it’s an essential aspect of new business development. Marketing methods change and adapt and what you did yesterday may not be effective today. What’s more, your competitors may deploy tactics that steal a march on the market and attack your client base. In truth, there isn’t a total solution or one size that fits all. You need to keep abreast of developments. LinkedIn adds new features regularly. New tools for marketing come out all the time. Market entrants pop up. And, of course, traditional marketing methods persist such as email, direct mail and even telemarketing despite what some ‘social media’ experts might suggest. We found it amusing the other day to learn that an inbound lead generation specialist generates the bulk of its new leads from telemarketing and, likewise, we know of an SEO agency that gained its largest client via the same route. Whilst budgets are never unlimited and spreading them too thinly could result in ineffective and insufficient lead generation, you can’t ignore one method at the expense of others. That doesn’t mean flip flopping as each new opportunity arises. However, subject to suitability, it does mean that you need to consider the various options. PPC is a relevant option for many whilst the cost per click and subsequent quality of those clicks may not be what some organisations need or can afford. SEO is clearly important for most businesses since search is king. Equally, even the best SEO expert, working on a poor website that lacks relevant content is likely to falter. Likewise, content that is insufficient and/or ill-targeted is tantamount to being useless. And, good content is one of the main drivers of rankings and engagement. If you need to reach a large audience, there are several options ranging from pure advertising to native to PR, for credibility, and so on. And, of course, in a b2b context, you cannot ignore LinkedIn but even that absorbs time if you want to maximise effectiveness and do it properly. Nowadays, there are tools available to automate some of the operational processes for LinkedIn, but you must take care not to flout LinkedIn T&Cs. We’re fans of content syndication to drive leads either on an MQL (marketing qualified lead) or SQL (sales qualified lead) basis. But, you need the wherewithal to generate interesting and compelling content and you need to be broad enough in your audience choice to generate enough leads in the first place. However, some people downloading your content may be researching not buying. This maelstrom of choice and is where good advice comes in. You either need to spend time investigating your options or you need to speak to an expert. Even marketing consultants may struggle to keep up to date. We spend all our time in the lead generation world. So, feel free to check us out and give us a call to discuss your lead generation challenges. 5 key Telemarketing Tips for small businesses– Olympics special!